Buhari’s health needs urgent medical attention – Falana Reveals. 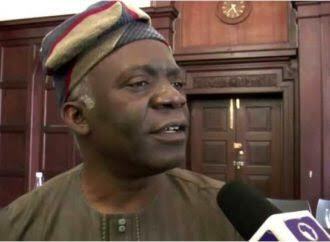 Foremost lawyer and human rights activist, Femi Falana has called on President Muhammadu Buhari to urgently seek for medical leave. Buhari had on March returned from the UK, where he was on medical vacation for weeks. However, observations revealed that since his return, the president has only made a few public appearances, fuelling speculation about his health. Falana in a statement issued on Monday, urged the President to take the advice of his personal physician and take some time to attend his health. “When President Muhammadu Buhari was recently in the United Kingdom on a medical vacation, which lasted 49 days, many public officers said that he was ‘hale and hearty.’ But upon his return to the country, President Buhari disclosed that he had never been that sick in his entire life,” the statement read. “Even though the president did not disclose the nature of his ailment, he revealed that he went through blood transfusion. While thanking the Nigerian people for their prayers, the president announced that he might soon travel back for further medical treatment. “A few weeks ago, the governor of Kaduna state, Mr Nasir El-Rufai urged Nigerians to give President Buhari time to recover from his sickness. The plea was made after the governor had visited and presumably assessed the state of the president at the presidential villa in Abuja. “However, due to the apparent deterioration in the president’s health condition, he has neither been seen in public in the last one week nor attended the last two meetings of the federal executive council. His absence at the last Jumat service in the villa has fuelled further speculations and rumours on President Buhari’s medical condition”, he said. The statement said rather than update Nigerians on the state of Buhari’s health, government officials have been saying: “there is no need for apprehension over the matter”. “Instead of embarking on regular briefing on the actual state of the health of President Buhari, officials of the federal government have continued to assure the Nigerian people,” it said. “In defending the absence of the president at the last FEC meeting and other state functions, the senior special assistant to the president on media and publicity, Mr Garba Shehu stated that ‘the president’s doctors have advised on his taking things slowly, as he fully recovers from the long period of treatment in the United Kingdom some weeks ago’.